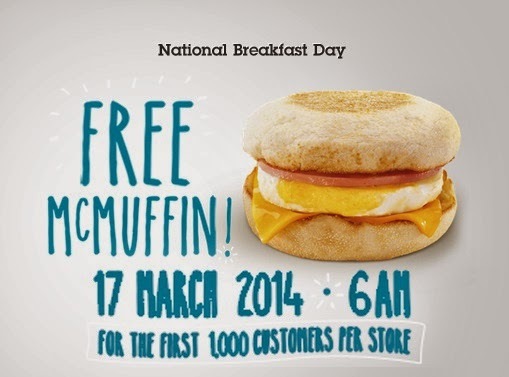 Manila, Philippines - Starting 6:00AM today, March 17, 2014, fastfood chain McDonald's will give out free McMuffins to its 315,000 customers in celebration of the second National Breakfast Day in the country. All participating McDonald’s breakfast stores nationwide are joining the celebration to say “thank you” to its customers who start their day at McDonald’s. Each participating McDonald’s breakfast store will be giving away free McMuffins to the first 1,000 customers at a first-come-first-serve basis – that’s over 315,000 hot and fresh McMuffins to be given away nationwide via Dine-In, Take-Out, and Drive-Thru. McDonald's Philippines PR and communications manager Adi Timbol clarified that the mall-based branches are not joining the event, as they open late. For the free 1,000 McMuffins, coupons will be given per customer and will be valid between 6:00am to 9:00am on the same day only. Once customer has surrendered the coupon at the counter, his/her hand will be stamped by the crew to validate that the McMuffin has been received and may not be given another coupon. View the list of participating stores for National Breakfast Day 2014 here. The event will be held simultaneously in McDonald’s branches in Asia Pacific, Middle East and Africa. “We were so encouraged by our customers’ resounding response in the region last year, we are bringing back National Breakfast Day to remind people about waking up to better mornings with breakfast,” said Andrew Hipsley, chief brand officer of McDonald’s for Asia Pacific, Middle East and Africa. The McMuffin is a family of breakfast sandwiches in various sizes and variants. The first National Breakfast Day was held in the country on March 18, 2013.